New 'Trek' Goes 'Into Darkness,' But Not Much Deeper NPR's Bob Mondello says J.J. Abrams' latest Star Trek film knows how to make the sparks and feelings fly, but doesn't bother making the sparks and feeling matter very much. 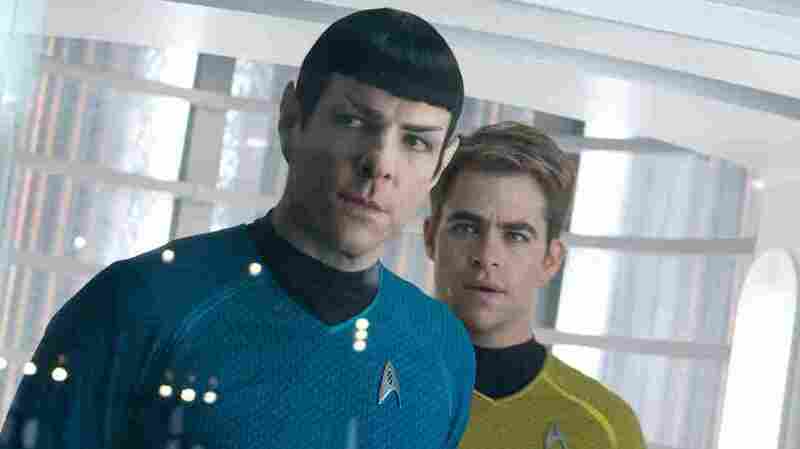 Zachary Quinto as Spock, with Chris Pine as Kirk, in Star Trek: Into Darkness. The opening sequence of J.J. Abram's new entry in the Star Trek universe has all the ingredients of the classic franchise. There's Kirk and his crew bellowing on the bridge, everyone worrying about the prime directive and our favorite Vulcan trapped in a volcano. Rated PG-13 for intense sequences of sci-fi action and violence. OK, I'm in. I may not be a fanboy anymore, but I sure was in my youth, and having these guys in their youths again is just as cool at the outset as it was last time. 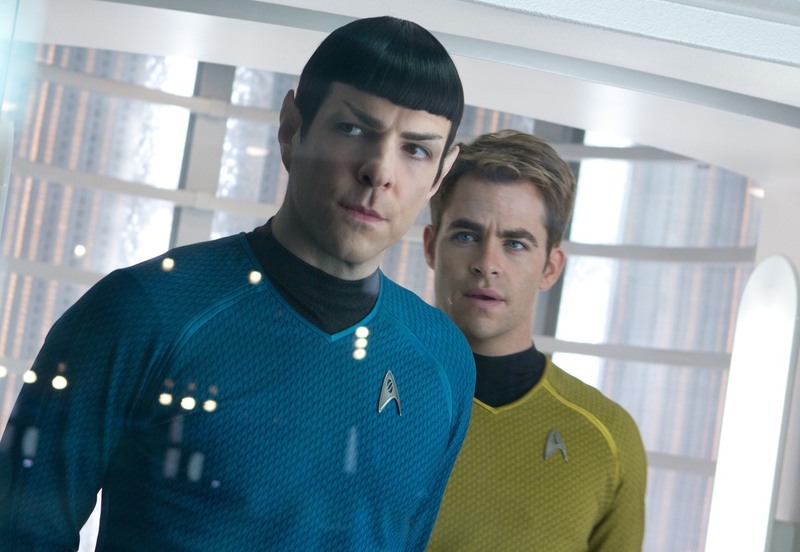 Chris Pine's baby-Shatner is spitting his lines while Zachary Quinto channels his inner Nimoy. We know these characters even if the reboot resulted in some weirdness. Spock and Uhura romantically involved, for instance. Even Kirk seems perplexed by that one. Just as TV's original Trek boldly went where '60s civics classes had gone before, Star Trek: Into Darkness, tackles issues with a contemporary ring. There's a suicide bombing, drones and some chatter about genetic engineering. All of it is debated by Kirk's man of action, Spock's man of thought and a villain who's a little of each. Benedict Cumberbatch plays a consummate warrior who surrenders to Kirk when he clearly doesn't have to. Director Abrams is working with a script that touches just about every touchstone from the original series you could imagine, which means I can't talk about much of anything without spoiling the fun. Happily, there's a good deal of fun if you like things crashing violently into each other and out of warp-drive at regular intervals. At one point, while a character urgently aligned what looked like giant sparkplugs, as if the drifting Enterprise were a stalled Buick, I found myself thinking that the film seemed aimed pretty precisely at the mindset of a 16-year-old boy. There is lot of stuff blowing up, strong feelings nobody quite knows what to do with, rule-breaking is a turn-on, and girls are largely eye candy and confounding. All of this is tied to a plot that's almost entirely concerned with getting from one cliffhanger to the next, which is exciting, but never left me feeling terribly engaged, to borrow a term from a later generation's commander. This team of filmmakers knows how to make the sparks fly and how to mix the sparks with feeling, but it doesn't bother making the sparks and feeling matter very much. Does that matter very much? Probably not, if you're just looking to trek, with a bucket of popcorn, into some multiplex darkness.